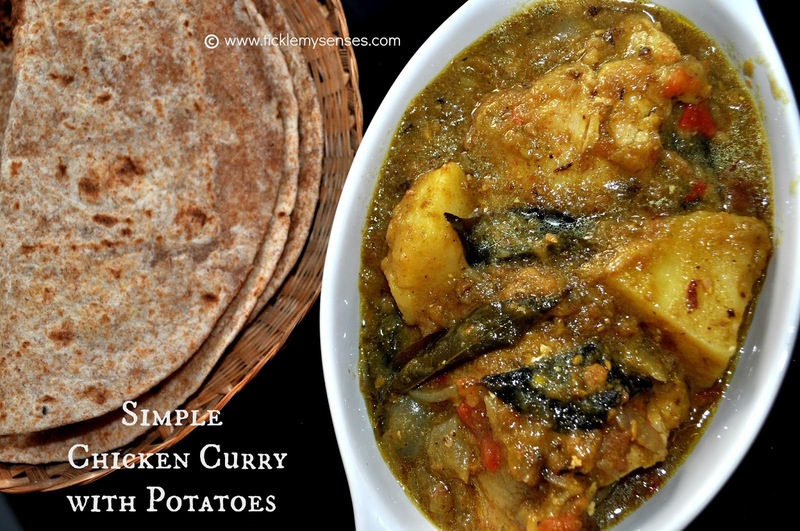 Tickle My Senses: Simple Chicken Curry with Potatoes without Coconut. If you have never tried adding potatoes to your curry, and you are wondering what the obsession is all about, let me tell you. It is bewildering as to how the most ordinary potato, absorbs all the wonderful flavours from a curry as its cooks, to magically metamorphose into a delicious spice packed bomb. Each starchy bite releases these wonderful savoury spicy flavours into your mouth...ooo so delicious and gratifying. Well todays dish is a mildly spiced semi thick chicken curry that is bursting with the flavour of fragrant spices like cumin, fennel, cardamom, cinnamon, cloves, pepper corns and green chillies. Much akin to a stew but without the added calories of coconut milk, it makes a perfect accompaniment to chappatis, panpole/ neer dosa or puris. Why not savour the simplicity of its flavours. 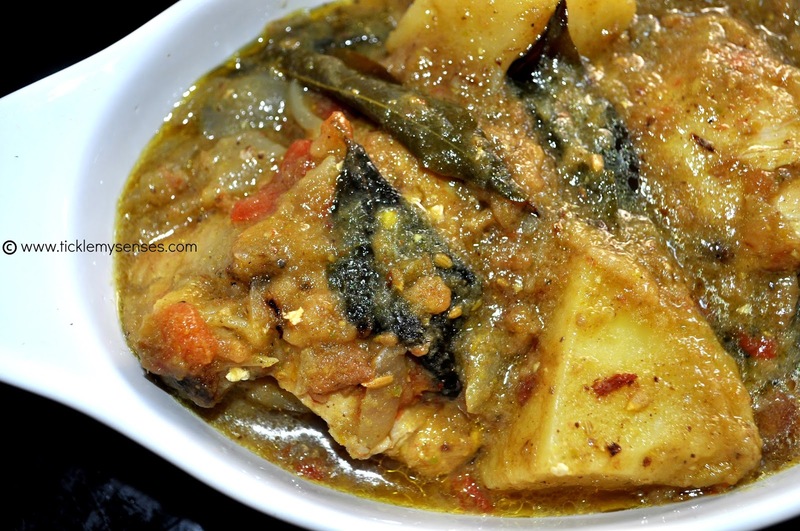 To Make Simple Chicken Curry with Potatoes without Coconut. Serves: 4 | Preparation time: 30 mins | Cooking time: 40 minutes. Potato: 1 large, cubed into 2 inch pieces. 1. In a wide non stick vessel, take oil, once hot add the curry leaves, fry for 30 seconds, add the chicken pieces one by one into hot oil in a single layer and allow one side to slightly brown on a high flame, before turning to the other side to brown. Should take 3-4 minutes each side. Then add the onions and tomatoes, cubed potatoes, pour over hot water, add salt to taste, close lid and allow the chicken to cook on a medium flame till almost done. Should take around 25 minutes. 2. As the chicken is cooking prepare the masala/spice paste. Place all the ingredients for the masala into a grinder/ blender add a little at water and grind finely. 3. In a non stick pan take a little oil, when hot add the sliced onion for seasoning and fry till brown, then add the ground masala and fry well for around 7-10 minutes. Add this fried masala/ spice paste to the chicken curry and gently stir making sure not to break the potatoes. Add more water if required to for a thinner gravy. Adjust salt and add vinegar to taste, allow the mixture to gently simmer for 5 more minutes before taking off the heat. Serve with chappatis, panpole/ neer dosa or puris. Looking for more Chicken Curry recipes, why not give these a try? 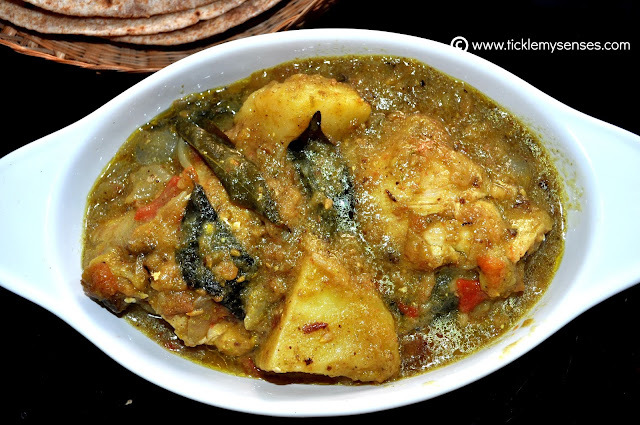 Mangalorean Chicken Stew with Vegetables. Stumbled upon ur blog & so glad I that did !!!! As the recipe title suggests this recipe is a chicken curry without coconut, hence there has been no mention of coconut in this recipe. I hope this helps and you do find many recipes here that you will like. South Indian Green Chilli Chicken Dry.